WIMBLEDON, England (AP) — One Wimbledon title wasn't enough for Serena Williams. About five hours after Williams won her fifth singles title by beating Agnieszka Radwanska, she and sister Venus were back on Centre Court to beat Czech duo Andrea Hlavackova and Lucie Hradecka 7-5, 6-4 Saturday in the doubles final. It was their fifth Wimbledon doubles title together, and came shortly after Venus watched her little sister win the singles final. 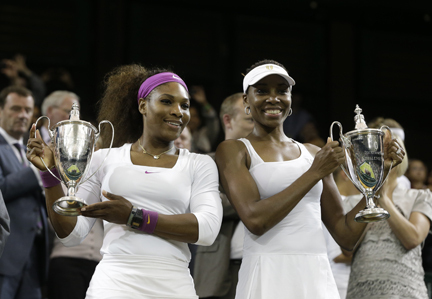 "I was definitely inspired by Serena's singles performance," Venus said. "Obviously it's wonderful to play on the court with her. I couldn't have done it without her, so it's great." Both sisters have battled health issues over the last two years, with Venus having been diagnosed with an energy-sapping illness and Serena overcoming blood clots in her lungs and two operations after cutting her feet on glass in 2010. This was their first doubles tournament together in two years, and they looked as if they hadn't missed a beat. "She's such a fighter, you never say die," Venus said about her sister. "I don't think either of us believe that we can be defeated by anything. Nothing has defeated us yet, so we're going to keep that track record." Serena was the last woman to win both the singles and doubles titles at Wimbledon, in 2009. Playing under the closed roof, Venus Williams served out the match less than 15 minutes before the 11 p.m. deadline for the end of play on Centre Court. Had the match gone to a third set, they probably would have had to come back and finish it off on Sunday. "I told Venus on the court, it doesn't matter," Serena said. "We weren't really racing the clock, we were just playing our opponents who were playing really tough and really good."